As Americans become more aware of the hazards of high sugar consumption, a seemingly never-ending parade of natural sweeteners have come to market. 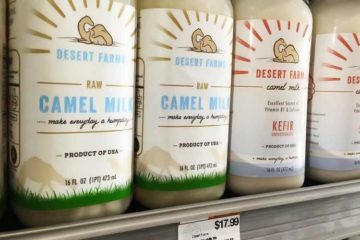 From jaggery to Jamaican sweetsop, marketers of each claim that actually, their alternative sweetener is the one that’s good for you. The problem is that many rely on hype, instead of scientific facts or clinical studies. One of the latest to hit the shelves is maguey sap. Marketing claims are ambitious and creative. It’s said to be “low GI” and made using “pre-Hispanic” plants or methods. So is just marketing hype… or are there bona fide health benefits of maguey? Maguey is the shortened name for pencas de maguey. That’s Spanish for maguey leaf. The English translation for maguey plant is agave. Often it’s referencing the type used to make tequila, which is the Agave tequilana species, more commonly known as blue agave. The pronunciation of maguey is ma-gay. It’s two syllables. It’s not ma-goo-e, which is how a native English speaker may be inclined to pronounce it. The exact definition of maguey is not clearly defined. It can refer to any species in the Agave genus, which includes the Agave americana, or century plant. It can also refer to the Furcraea genus, which are similar yet different succulents than what’s typically called agave. The species used for making sweetener is often Agave salmiana. Maguey sap tastes like a cross between molasses and sweet corn. It’s thick and high viscosity, just normal agave syrup. Depending on the crop and level of refinement, the color ranges from amber to rich brown. Some people call it maguey honey, even though there’s no honey inside. It’s 100% plant-based, so it is vegan. It’s gluten free and allergy friendly, since allergic reactions to agave plants are rare. As with jaggery and molasses, it is a sweetener with a history that goes back centuries, if not longer. Maguey uses as a food source were far before the invention of white refined beet or cane sugar. There are are over 200 varieties of agave species. Pre-Hispanic or pre-Spanish maguey plants are in reference to the species which were cultivated by the indigenous people of Central and South America. Most notably, the Agave salmiana. It’s a species which has been cultivated for over a thousand years on the plateau of Calpulalpan and Apan, in the states of Hidalgo and Tlaxcala, Mexico. When you buy maguey sap or maguey honey, it’s made using the agave species that may have been cultivated by the Aztecs and other ancient natives. That’s different than normal agave syrup, which is usually made from Agave tequilana (blue agave). It’s not a pre-Spanish variety. 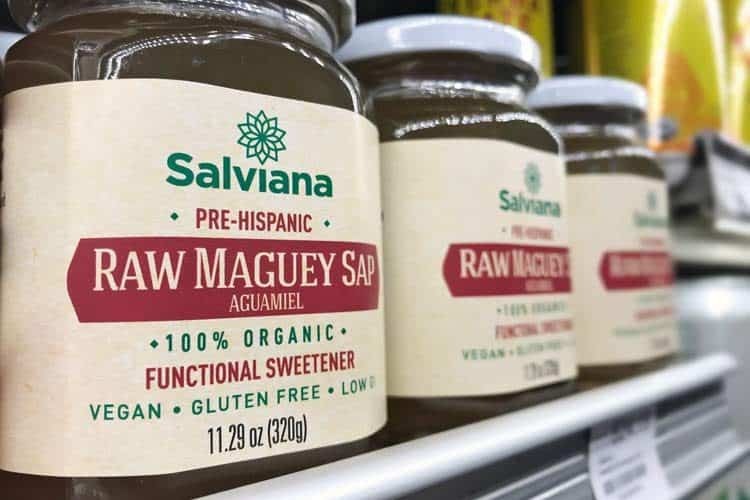 Organic unrefined and raw maguey sap is commonly marketed as a “functional sweetener” that is a natural source of prebiotic fiber, probiotics, vitamins, minerals, and other nutrients. Some claim it has a low glycemic index (GI), helps strengthen the immune system, and helps with weight loss. As with maple syrup, yacon syrup, and coconut blossom nectar, it is true that maguey sweetener is better for you than refined white table sugar. However, that’s a low bar to beat. Regular sugar is so refined, it has virtually no vitamins or minerals. Because it’s so pure, its glycemic index is highest. Less refined sweeteners like raw maguey may have trace amounts of potassium, calcium, magnesium, and vitamin C, but the amount you’re getting is negligible. 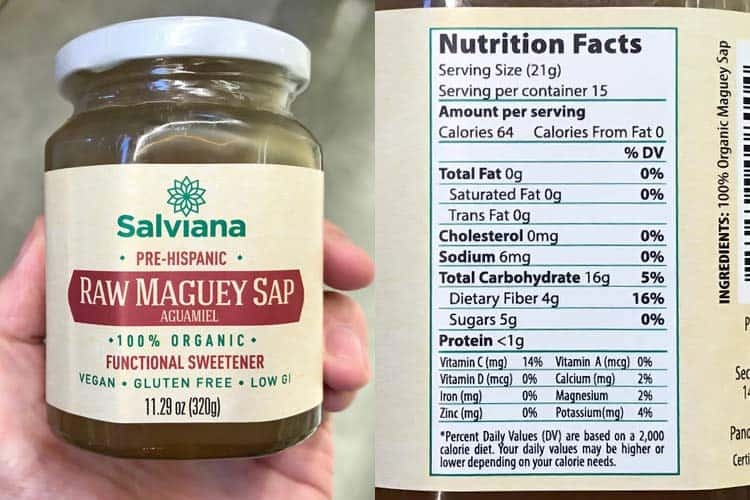 The nutrition facts for raw maguey sap by Salviana report a serving size as being 21g. 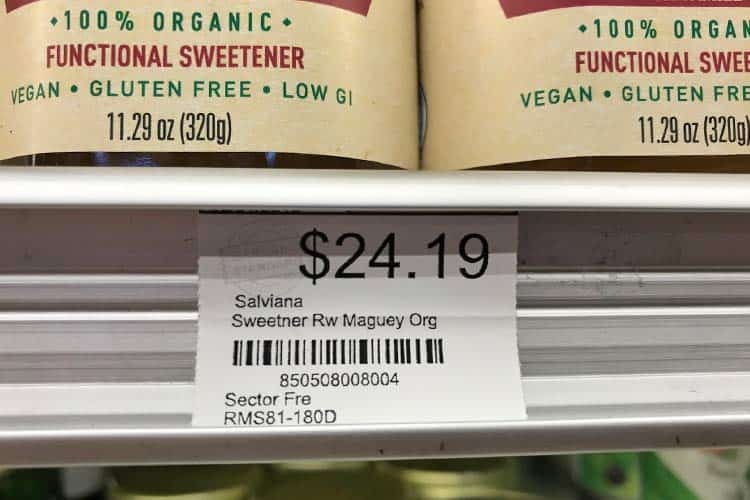 They don’t say the size that 21g represents, but given that 1 tablespoon of Wholesome brand organic blue agave syrup also weighs 21g, it’s safe to assume that Salviana’s serving size represents the same. For a 1 Tbsp serving of maguey, you’re consuming 64 calories. 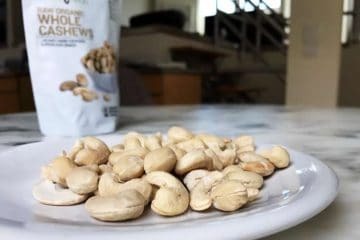 The good news is that there are only 5g of sugar and 4g of dietary fiber, which represents 16% of the daily value. Vitamin C is moderate at 14% since it’s the raw sap. If pasteurized (heated) the vitamin C content would be destroyed. 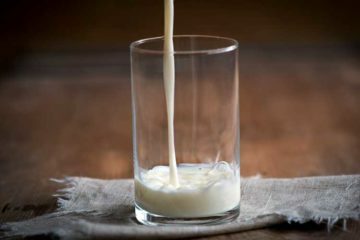 The bad news is that the essential minerals listed – calcium, magnesium, and potassium – are all less than 5% of the daily value. One teaspoon of pure white sugar has 4g of sugar (sucrose). That means a maguey tablespoon – which is 3x as big as a teaspoon – only has 1.25x the sugar content. This may sound like an advantage, until you analyze the carbs inside. Blue agave nectar has a very low glycemic index of 10 or 11 for one reason only; most of the sugar is in the form of fructose, not glucose. The glycemic index scale only measures glucose, not fructose. This is why agave syrup can honestly claim to be a low GI sweetener. Though high amounts of fructose aren’t good for you, either. 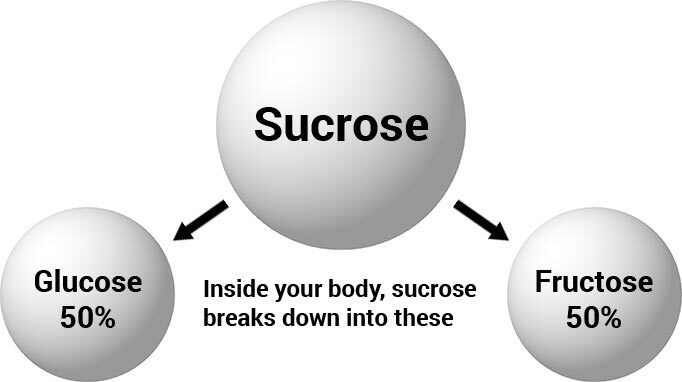 Sucrose is the scientific name for regular white sugar. It’s half fructose and half glucose. Both components impact your blood sugar, but they do so in different ways. Glucose is absorbed almost instantly. Fructose, which is most prevalent in fruit and honey, eventually ends up as glucose, too. To become glucose, fructose is converted by the liver. This why high fructose corn syrup, and large amounts of fructose in general, are believed to be responsible for the epidemic of fatty liver and insulin resistance. Basically, both fructose and glucose are bad for you in excess. Eating high amounts of one, the other, or both (e.g. table sugar) are all bad for you. The glycemic index of maguey sap has not been published. This is not surprising, as the test requires at least 10 individuals who undergo fasting, followed by controlled eating, with blood sugar monitoring before and after. It takes time and money, which so far, no one has ponied up. The reason agave nectar has such as low GI is because it’s 90-97% fructose. With only 3-10% being glucose or sucrose, of course the glycemic index will be low because this scale is only measuring the impact of the glucose portion! As far as the ratio of fructose vs. glucose in syrup derived from the maguey plant, it should similar to blue agave syrup. The main benefits of maguey are the fructooligosaccharides (FOS). That’s a long word made popular by the Dr. Oz show, in reference to yacon syrup, which also contains FOS. FOS are sweet-tasting molecules which we taste, but can’t absorb. However your gut flora can… they do so by fermenting them. That’s how fructooligosaccharides serve as a prebiotic. They feed the probiotics in your intestines. Eating too much maguey, or another source of FOS, can lead to gas and bloating – because that prebiotic content gets fermented. 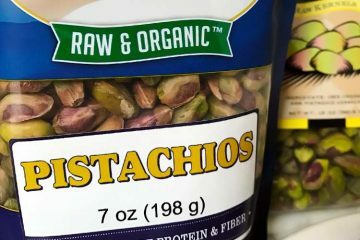 Fermentation leads to farts, a side effect no one wants! That potential benefit, along with the small but still noteworthy vitamin C content, are advantages that maguey offers over white or brown sugar. At a local health foods store here in west Los Angeles, this small 11 ounce jar of maguey was for sale with a whopping $24 price tag. That’s a lot of money to pay for something that’s healthier, but not necessarily healthy. 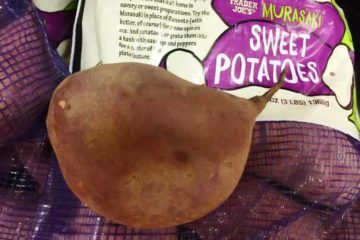 Murasaki Japanese Sweet Potato a Recipe For Disaster?